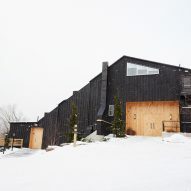 Brooklyn-based Studio Tack has transformed a 1960s guesthouse in upstate New York into a boutique hotel with snug interiors and impressive mountain views. 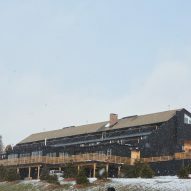 Scribner's Catskill Lodge is situated a short drive from the ski slopes of Hunter Mountain, which are visible from the property. The building dates back to the 1960s, when it served as a motor lodge that allowed guests to drive right through its centre. The former vehicle access now serves as the main entrance. "From the imposing exterior, resplendent in late modernist glory, guests enter into a wholly unexpected space," said the design team. Behind the doors, Studio Tack transformed the cavernous interior into the hotel reception, where stone flagstones are illuminated from high above by a skylight. Further back, the remainder of the car port now serves as a communal area. 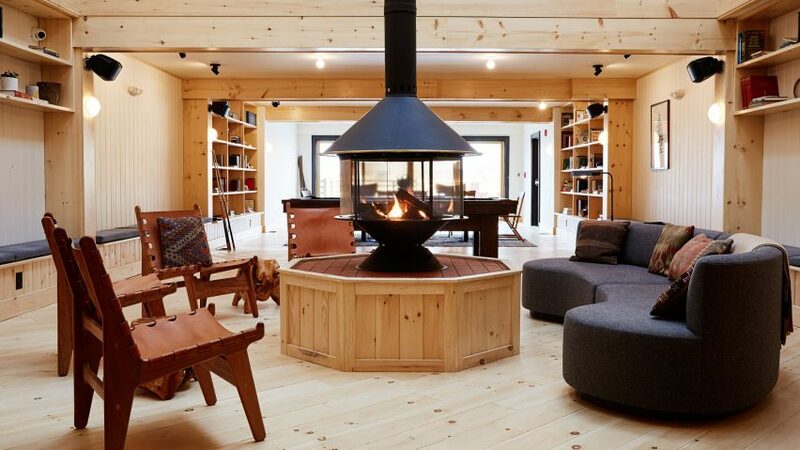 Here, the floor is raised to create a cosier space, with a central fireplace and walls lined with bookshelves. The restaurant and bar on the lowest level is lined with panels of pale wood, oriented diagonally. 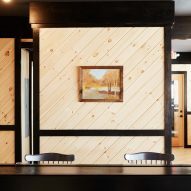 These are framed by black-stained planks, matching the custom seating booths and the building's exterior. The dining area opens onto an expansive deck that boasts uninterrupted views of the Catskills Mountains on the other side of the valley. 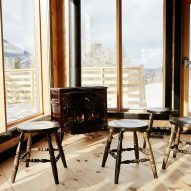 During the winter, the vista can be enjoyed through the glazed frontage from fireside seating. Arranged over three levels, most of the 38 hotel rooms also face this view. Each is minimally decorated, with pale surfaces offset with dark wood floors and patterned rugs. "Invoking a carefree-bohemian vibe, the all-white rooms appear clean and modern, while incorporating offbeat details of the past with a nod to the area's craftsmen," said the design team. 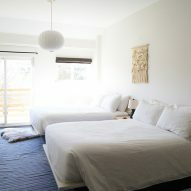 The rooms vary in size and layout, with some featuring high-peaked ceilings, loft sleeping spaces and in-room fireplaces. Bathrooms are lined in terracotta tiles. In front of the main building, which also had its blackened-wood exterior restored, guests can huddle around a fire pit and toast marshmallows. 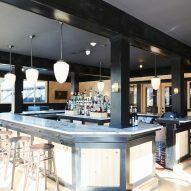 "The group wanted to make Scribner's fresh and inviting while at the same time preserving the eccentricities that give this place charm and character," the team said. Upstate New York is a popular getaway for urbanites wanting to escape to the countryside. Cabins and winter retreats in the region include a secluded library in the woods and a remote writer's hideaway. 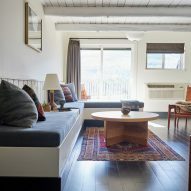 Photography courtesy of Scribner’s Catskill Lodge.